Home/Blog/Dog Excercise/WORKOUT YOUR DOG’S NOSE: Your dog will be happier and so will you! 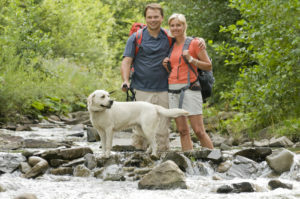 It’s often said that your dog is best behaved when he or she gets enough exercise. However, during a run of inclement weather, it”s sometimes difficult to get your dog the exercise that they need. If your dog enjoys sniffing around on walks a lot, then you can exercise your dog inside too. Teach your dog to use their nose to tire themselves out by playing a beginner search and rescue game with them. Play this game for 15 -20 minutes a day before you feed them and you may find that they’re much more relaxed throughout the day. One side benefit is that they may find it easier to digest their food as well, as the scenting and searching mimics hunting and scavenging behavior which can prime your dog’s digestive system as their body goes through the mimicked ritual of seeking out food prior to each meal. The main focus, for us as trainers, though is burning up energy; since a large part of your dog’s brain is devoted to scent discrimination, this exercise can help entertain your dog and tire your dog out for hours after playing this game. Here’s a step by step dog training guide to teach your dog how to go from visual finding to scent basedsearches. Keep in mind that this doesn’t replace walks or other exercise totally but it may make up for all the outside time you might be missing with your dog when the weather causes you to stay indoors more. You may take a couple of days at each phase of this game, but some people find that they’re through to Phase Four in just a couple of days. As I tell all clients that I work with, take it a step at a time and follow a natural learning process; start easy and let your dog incrementally adapt to progressive challenge. This phase describes the basic exercise. The following phases are simply increasing the degree of difficulty for your dog. Get good at this ”visual find” first before moving to the next phase. Frequency: Do this process several times over a couple of days. If they can’t hold a stay, then you probably need a helper to make sure they stay in the room you leave them in OR you can use your leash attached to s solid object, to restrict them in the room you leave them on a sit stay and then unleash them when you go back to start the game. Go hide their favorite toy, ball or a toy with a treat inside of it in an easy hiding spot where it is in plain view once they get close to the object so they can easily find it. Go back to your dog in the room you left them in and say “find it!” –walk with them into the room where you hid the object and walk over to where it is while you repeat the command “find it!” Once they pick it up, praise them like they just learned to walk on a tight rope in the circus, and play with the toy (if it’s a tug or a ball) or let them have the goodie they found! Then go back to your starting place and have them drop the object or give it to you. NOTE: With these first several trials of this game make sure you stop before your dog loses interest or gets tired. Depending on your dog’s breed and personality, your first few sessions may only consist of 2 to 5 trials. PHASE TWO: BEGIN TO CHALLENGE THE NOSE! Frequency: Repeat this phase of increasing difficulty several times over a couple of days. Repeat the same steps as in phase one except make the hiding spots progressively more challenging. In this phase of hiding, allow only partial visibility of the object. Frequency: 3-5 repetitions a day over a couple of days. Goal: Wean your dog off of the need to have you near them to find objects. Once your dog can find partially visible objects with a little help from you (that is, you walking near the hiding spot and repeating “find it!”) then let your dog venture out further than where you are on his or her own to sniff around for the object, while you say ‘find it!” from further away. As they start using their nose more, sniffing the air or ground, start praising them as they do so. Once they find the hidden object, praise them profusely as before and play or let them have the treat they found. Frequency: 3-5 repetitions a day over a couple of days. Goal: Transition from visually finding to finding based on scent alone. Once your dog can find partially hidden objects on their own, hide the object where they can’t see it at all but where air is available to scent (like behind a basket or behind an almost closed door. NOTE: these spots may require you to get the toy out once they identify that they know it’s in there. Once your dog gets excited at the correct hiding spot – praise them, get the toy out, toss it to them, play a bit (if it’s a tug or a ball) and praise them once they have it! Once your dog can search on his or her own for completely hidden objects, play this game for 15 minutes a day before you feed them and you’ll find they are much more relaxed the rest of the day and they may find it easier to digest their food as the search and find activity mimics hunting behavior. The whole idea of getting to this stage is to train your dog to use their scenting ability for 15 to 20 minutes. Since a large part of their brain is devoted to scent discrimination, these games can help entertain your dog and tire your dog out for hours after playing this game. you can repeat this exercise with a person! Give a person the search object and direct your dog to “find (place name here)!” Once they find the person have them throw the object to them and praise them excitedly and play with them for a few minutes. Kids who are old enough to consistently throw the object to your dog once they”re found, and who can consistently praise your dog, are great candidates for the search game with a person. If you have reliable off leash control of your dog, you can even extend this game to the back yard, or to the park. If your dog shows lots of interest, you might try this game on your next hike or camping trip! Now, go have some fun with your dog!